According to a report published on HubSpot, businesses with a blog get 97% more inbound links than the one which doesn't. However, creating a blog is not the hard part, getting adequate traffic is. Now that your blog is up and running, you need to find new ways of expanding your audience base. 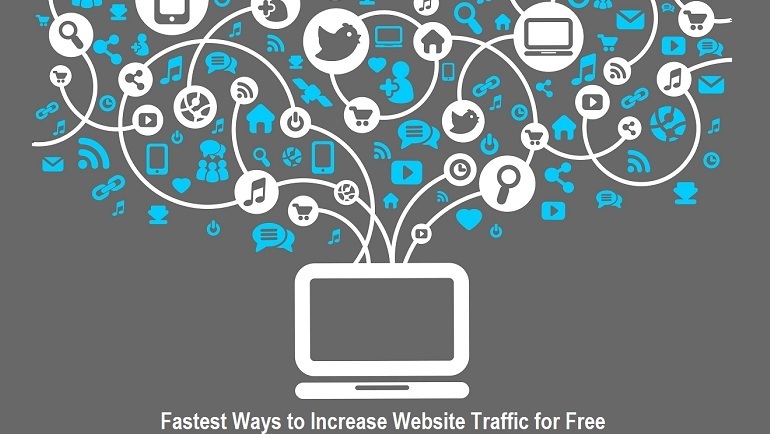 In today’s post, we are going to tell you about Top 6 Fastest Ways to Increase Website and Blog Traffic for Free from Search Engines, and you can also easily implement these tactics which would enormously boost the traffic of your blog or website. If you want to increase your blog traffic then you have to remember the basic rule of blogging viz. ‘Content is King’. Therefore the first and foremost thing you need to do is create quality content on a more or less regular basis. Better content isn’t just about the quality of the articles, but also about being intelligent with your content marketing efforts. Make sure that your content is meeting the specific needs or answering the questions of your target audience. So try to figure out the kind of audience you have and the kind of things they might be interested to read. If you want some new ideas then go to Quora and find out the kind of questions which are being asked in your niche. You can also check out Buzzsumo to find out what others have written on your niche and then you can create something interesting out of it. Try to come with your own pictures to go with the blog rather than using the stock images. Coming up with good content isn’t enough to make your blog click. If you want more traffic then you need to come up with SEO friendly articles. SEO when done in the right way never interferes with the quality of your content. So make sure to research a few relevant keyword or key phrases and incorporate them in your writing in a natural way. If you don’t have enough time for that then you should hire the services of SEO company or hire a freelance writer to do the writing and SEO part for you. Ideally, you need to create your presence in the 4 main social networking channels- Facebook, Twitter, LinkedIn and Google Plus. All these networks are used by billions of internet users from all around the globe and sharing your content on these sites would help you to reach out to the maximum number of followers. Make sure to create a compelling page for your blog with photos and engaging descriptions. If your posts are good enough, then your audience is going to comment on them and share them. Make sure to use hashtags for further interaction with the community. If you are creating your own images then it’s highly recommended that you do it in a way which would allow others to use your photos on their websites legally. If you don’t have the time to create your own images or illustrations, then use images from other sites and cite the source name. If the headline of your article isn’t catchy then not many viewers would be prompted to read beyond the first few lines. According to some successful bloggers, the headline is even more important than the actual content. A lackluster headline is not going to promote your blog post. So ensure that your content writer is skilled enough to create catchy headlines to attract more viewers. Doing all the writing on your own might sound like an impossible task. If you are looking forward to hiring quality writers for your blog then look no further than you can hire the professional freelance writers online from various freelancing websites i.e. Fiverr, Upwork, Freelancer, Contentmart etc. These are the most popular online platforms for freelance writers and it's just the right place to pick your writer from. All you need to do is create an account, log in and then post your content requirements. Make sure to mention the topic, the number of words needed and the keywords. Lots of skilled and experienced writers are going to bid on your project. You need to select a writer with good ratings and reviews for your job. Ideally, you should also check the portfolio of the writers to see if their writing standard matches your requirement. You can also interview a writer on the personal chat box before awarding him/her the project. In case you don’t like the quality of the article or want any specific changes then you can always request the freelancer to make the necessary changes before you accept the project. If you are looking forward to making your Business stand out then consider hiring a good article writer for your official blogs and websites now.